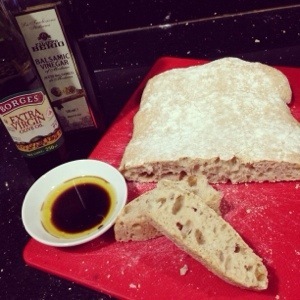 The Pseudo Artisan Baker : Ciabatta | Eating Aloud! Food. Family. Humor. Rock N Roll. There was a lot of contemplation while I was deciding if I should try making a Ciabatta bread. I found a recipe on Foodwishes and it requires no kneading but a lot of WAITING! Fermentation took18 hours to be exact. I gave it close to 24 hours because I was at work. Look at all the big air pockets on it! Soft interior with a hard crusty exterior. My kind of bread!